Kolkata, Apr 25 (UNI) A star-trek of celebrities, high voltage speeches and low-key processions marked the torrid electioneering, which ended at 1700 hours in Bengal today, as the state capital and its two adjoining districts geared up for the third phase polls on April 27. With the fate of 76 out of 77 constituencies at stake, Kolkata, North and South 24 Parganas districts go to polls to decide the fate of nine Left Front Ministers, including Chief Minister Buddhadeb Bhattacharjee, who are seeking re-election, besides, Assembly Speaker Hasim Abdul Halim. Polling was countermanded in one Assembly constituency in North 24 Parganas district - Bhatpara - following the death of Bahujan Samaj Party candidate. Election to the seat would take place on May 16. Prominent among others, whose fates will be decided in this phase, are Information Technology Minister Manab Mukherjee, Labour Minister Mohammad Amin, Housing Minister Gautam Deb, Land Reforms Minister Abdur Rezzak Molla, Sundarbans Development Minister Kanti Ganguly, Finance Minister Asim Dasgupta, PWD Minister Amar Chaudhury, Transport Minister Subhas Chakravarty. While former Mayor Subrata Mukherjee fights it out as a Congress nominee, Bengali film stars Biplab Chatterjee and Tapas Paul lock horns respectively as CPI(M) and Trinamool Congress candidates keeping the glamour quotient in balance. Altogether 12.5 million electorate would exercise their franchise to elect representatives from among a total of 485 candidates, including 38 women, on April 27 and May 16. After the peaceful polling in the first two phases that hardly had chances for a prolonged campaigning because of a Pollution Control Board ban on the use of loudspeakers till April 13, a 12-day space provided the political parties to go for an electrifying campaign for the third phase compensating for the past undoing. Though wall graffiti, the traditional mode of campaign in the state, was under a ban by the Election Commission, the ruling Left Front and the opposition Congress and Trinamool Congress left no stones unturned to woo the voters by pressing into campaign the party stalwarts. In a situation when the Congress-led UPA Government at the Centre was enjoying outside support from the Left, for the first time Congress President Sonia Gandhi had to campaign in favour of party candidates launching a sharp attack on the CPI(M)-led Left Front Government in the state. In a whirlwind campaign schedule, Ms Gandhi addressed three election meetings in the city and nearby areas asking the people to vote the Congress to power in order to make the state prosperous. Citing the UPA Government's 'pro-people' policies, including the Rural Employment Guarantee Scheme, she promised to take the state back to its pristine glory. Apart from Defence Minister Pranab Mukherjee, who is also the West Bengal Pradesh Congress President, Information and Broadcasting Minister Priyaranjan Dasmunsi and party General Secretary Margaret Alva were among the other star campaigners of the party. Ms Mamata Banerjee's Trinamool Congress, having an alliance with the BJP, roped in former Deputy Prime Minister L K Advani as the prize campaigner for the coalition, besides having the service of stalwarts like Bihar Chief Minister Nitish Kumar, BJP General Secretary Arun Jaitley and Ms Sushma Swaraj. In their campaign, both Ms Banerjee and the BJP leaders assailed the state government for its alleged 'allround failure' and appealed to the people to end the 29-year Left rule. Led by Mr Jyoti Basu, the nonagenarian CPI(M) Polit Bureau member, the campaign of the Left Front was no less eloquent with Chief Minister Buddhadeb Bhattacharjee bearing the brunt of the gruelling electioneering that made development as the main election issue. CPI(M) General Secretary Prakash Karat and Polit Bureau members Brinda Karat and Sitaram Yechury also addressed a string of rallies. However, the Front, having an electoral understanding with the Rashtriya Janata Dal and the Nationalist Congress Party in the state, perhaps could draw a greater attention of the people when RJD chief and former Bihar Chief Minister Lalu Prasad addressed few public meetings in the city in support of the lone RJD candidate, fielded from a city constituency, dominated by Hindi speaking electorate. With his inimitable vocabulary and accent, humour and sarcasm, Mr Prasad proved to be a successful crowd puller. Civil Aviation Minister Praful Patel also campaigned in the city for the Front-supported NCP candidate. However, the CPI(M) managed to put up the greatest show of support from the glamour world when a section of Bengali film and stage actors, singers, players, litterateurs and intellectuals rallied behind it by taking part in campaign programmes for Left candidates in different constituencies. Prominent among them were Bengali matinee idol Prosenjit, veteran film star Soumitra Chatterjee, footballer Bhaichung Bhutia, former olympian P K Banerjee, writer Sunil Gangopadhyay, film maker Mrinal Sen and celebrated magician P C Sorcar(Junior). 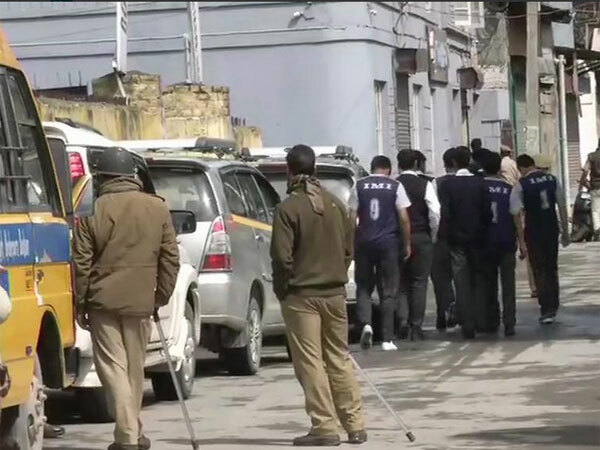 The polling is set to be held amid a very tight security with more than 50,000 central para miliatry force jawans manning all the 13790 polling booths and patrolling streets. Like in the first two phases, 3,000 digital cameras will be used to take photographs of voters without having photo identity cards. There was a massive deletion from the electoral rolls for the third phase of polling with 2.92 lakh names being dropped out of the list. While Kolkata accounts for 2434221 voters, North 24 Parganas has 5226801 voters and South 24 Parganas has 4952239 electorate. The number of polling stations is 2596 in Kolkata and 5712 and 5482 respectively in North and South 24 Parganas. The city's Burra Bazar constituency has the maximum number of contestants-13--while as low as three candidates are in the fray each from Bishnupur(East) and Falta in South Twenty-Four Parganas and Panihati in North Twenty Four Parganas. The largest Assembly Constituency in terms of voters is Barasat in North 24 Parganas with an electorate of 3210342 while Sealdah in Kolkata with only 65157 voters is the smallest one.